It has been a long and bloody November my friends. As the month comes to an end, we must look back and assess who has come out victorious in the Bitcoin Cash hash war. But the result isn’t quite as clear as some would have you believe. A better question may be – who didn’t lose? For that we’ll need to assess 3 things – price, hash rate, and ticker symbol. With those key points in mind, let’s recap what happened. The overall hash rate prior to the chain split was 6,105 peta hashes per second on November 13th, 2018. 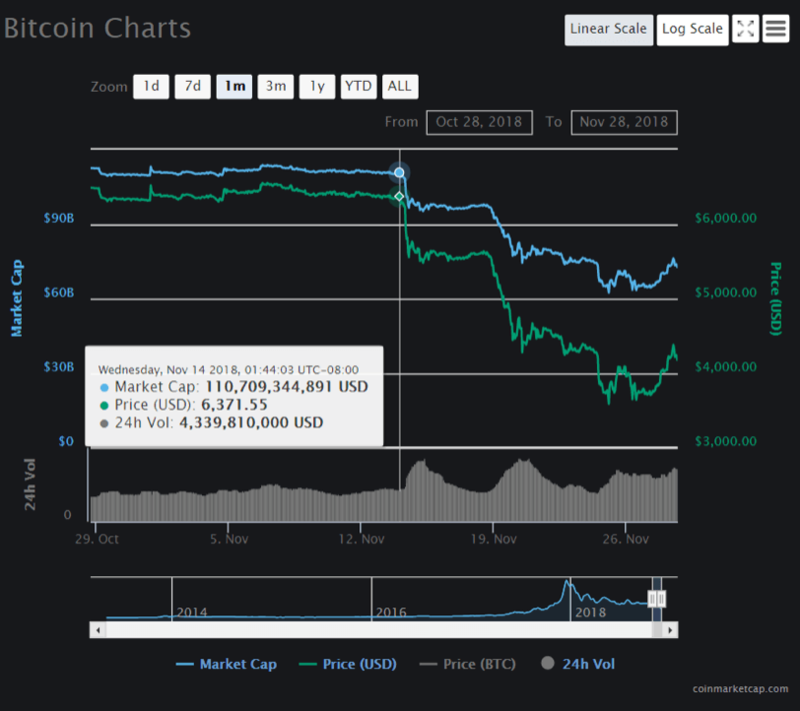 When November 14th rolled around, the price of Bitcoin and the rest of the market along with it took a dramatic turn downward. On November 15th, on block 558,525, the chain split happened and the war had officially begun. The hash rates of both chains combined to a whopping 12,000PH/s or double what they were just a couple days prior. Major players on both sides redirected hashing power from Bitcoin to the BCH ABC and BCH SV chains. This resulted in the ABC chain getting a substantial spike in hashing power up to 8500PH/s and SV to 4500PH/s. The result is clear and defined as far as hashing power goes. Bitcoin ABC, the originally planned upgrade to Bitcoin Cash reigned supreme. As it currently stands, the majority of hashing power has gone to the ABC chain. It leads the SV chain by 32% more completed work (which is the important metric to consider, NOT how many blocks one is ahead of the other). So what about the market value? ABC comes in at a familiar rank of #4 on Coinmarketcap’s list of cryptocurrencies. It has a $3.2 billion dollar market cap. Bitcoin SV sits at #9 on the list at $1.8 billion, roughly half the market value. And finally, what about the naming rights? If you haven’t already guessed it, take a look at the Bitcoin Cash Markets. 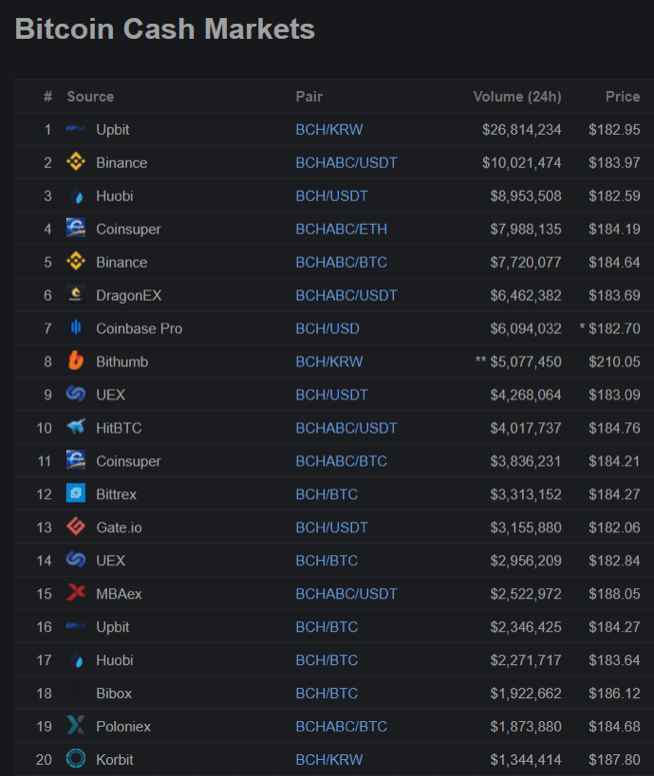 Out of the top 20 exchanges the BCH ticker symbol has been assigned directly to the ABC chain on 12 markets. The other 8 exchanges? Well they are going by a much longer ticker now, BCHABC and BCHSV respectively. The answer is clear. 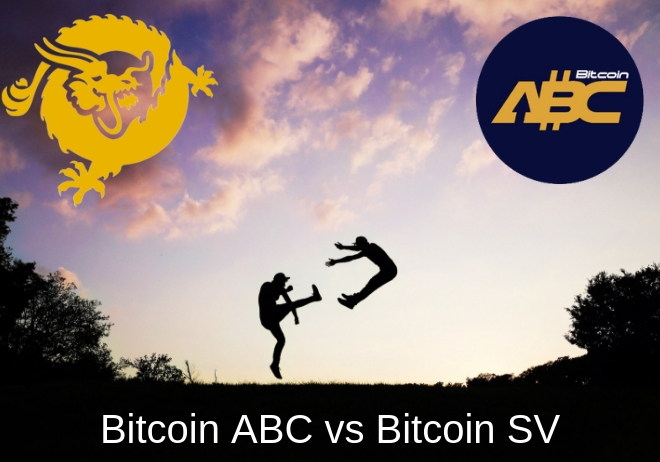 The ABC chain has won out over SV. It has the majority of hashing power, the higher overall value, and the majority of businesses supporting it for their products/services. But did either of them really win or is one just the lesser loser for the time being? Only time will tell if SV gains more adoption, and as a result, a greater share of the hashing power and higher market capitalization. One thing is for sure – the war has appeared to kick off an even greater decline in overall cryptocurrency market value. 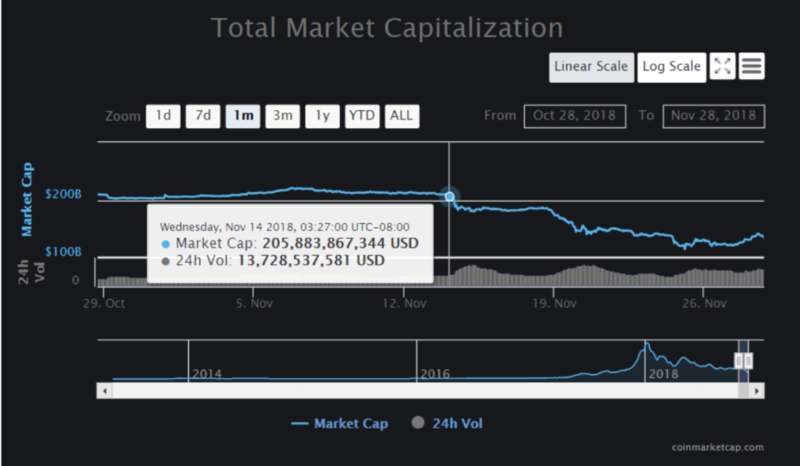 It has gone from $210 billion the day prior to the chain split to as little as $114 billion on the 25th of November. We can safely say the entire cryptocurrency market has lost out for now.